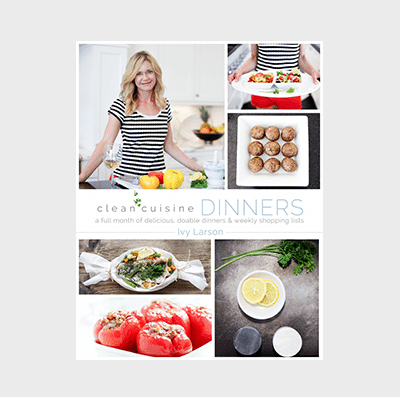 Clean Cuisine Dinners offers a full month of delicious, easy-to-make, anti-inflammatory meals not featured on the blog. 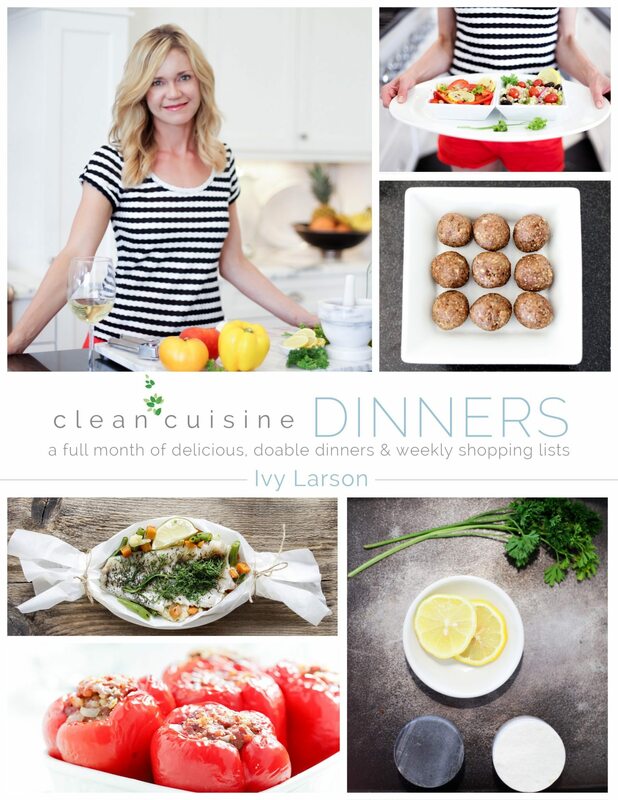 The Clean Cuisine DINNERS: a full month of delicious, doable dinners & weekly shopping lists cookbook is the dinner companion to Clean Cuisine: An 8-Week Anti-Inflammatory Nutrition Program that Will Change the Way You Age Look & Feel (Penguin, 2013). With over a hundred thousand Clean Cuisine followers, more and more families are starting to rethink what it means to really eat healthy. Low-fat, low-calorie and low-carb is out and nutrient-dense, plant-forward and whole foods are in. If you are trying to clean up your family’s meals there is no better place to start than at the dinner table. As long as the planning is done, pulling together deliciously nutritious dinners is a lot easier than you might think. 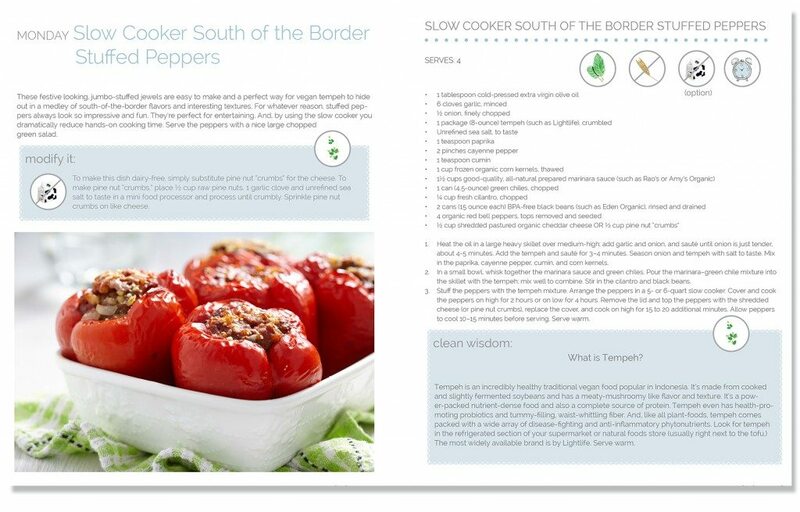 The main goal of this book is to provide a simple yet CLEAN solution to dinnertime. 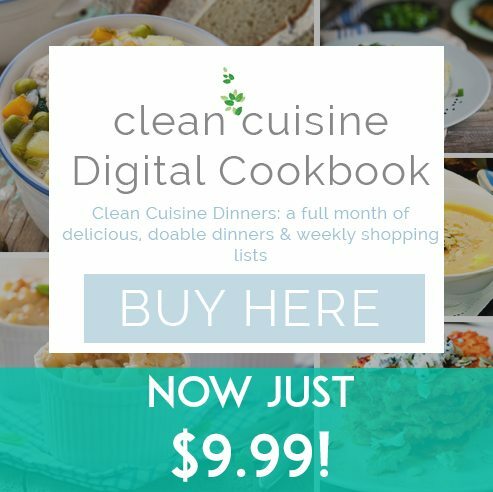 102 page cookbook with 51 NEW* Anti-inflammatory Clean Cuisine recipes! */**Recipes and Dinner Menu Plans are brand new and not found on website. A PEEK INSIDE THIS FLAVORFUL, FUSS-FREE, AND FRESH NEW GO-TO DINNER RECIPE GUIDE! WHO DOESN’T WANT TO SIT DOWN TO A GREAT DINNER AT THE END OF A LONG DAY? If clean eating is important to you and your family and you avoid (or try to avoid) processed, packaged convenience foods and fast foods, then surely you could use a helping hand come dinnertime. 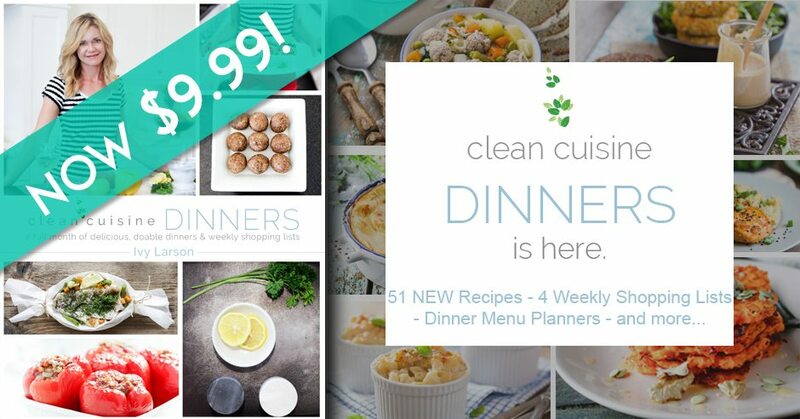 Clean Cuisine Dinners is our solution to helping you revamp, revive, and refresh your supper. We all want dishes we can make in our sleep, that never get old, that everyone loves. And that’s exactly what Clean Cuisine Dinners delivers. If you are familiar with Clean Cuisine and the amazing and far-reaching benefits of an anti-inflammatory whole foods diet, you might be wishing you could give your current family meals a complete makeover. But where do you go to find a collection of tasty and easy-to-prepare anti-inflammatory dinner meals the whole family will enjoy? If you haven’t had the time to plan your weekly dinners then it isn’t always easy to think of what to make off the cuff come 6 o’clock when you and the whole crew are starving. And let’s face it: making a delicious homespun dinner night after night takes effort. Although we can’t do the shopping, chopping and cooking for your, we can take the planning, guesswork and organization off your plate…. 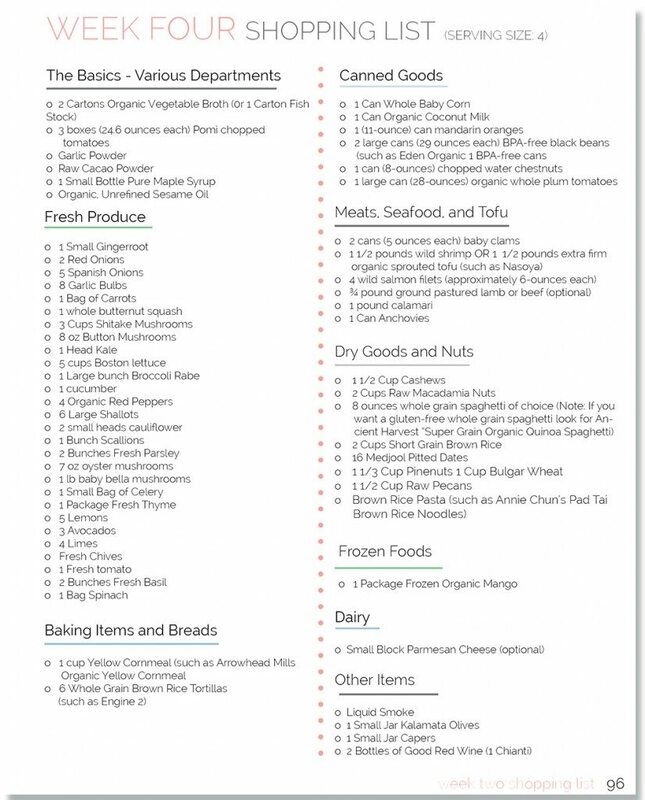 SHOPPING CHECKLIST BELOW THAT WILL MAKE YOUR TRIP TO THE STORE EASY PEASY…(EMPHASIS ON THE PEAS)! Do you, your spouse, a child or someone else in your family have an inflammatory condition who you know could benefit from eating anti-inflammatory meals on a consistent basis? If you had the option to put a nutritious and delicious dinner on the table for your family every night of the week, would you do so? Do you find that although it is your intention to feed your family a nourishing home cooked meal that somehow life seems to get in the way more often than not? Is dinnertime an organized, relaxed and enjoyable part of the day for you and your family? Or, do you often feel overwhelmed, stressed and flustered around the 6 o’clock hour because you don’t have a clue what in the world you are going to make for supper? Do you not even think about what to make for dinner until dinnertime? Do you think dinnertime would go more smoothly if you knew in advance what you would be making and if you actually had all of the ingredients on hand in your pantry and fridge? Would having a weekly dinner meal plan and grocery shopping list reduce dinnertime stress while also helping to ensure that the food you put on the table is nutritious and delicious? If you answered ‘yes’ to 3 out of the 7 questions then we have a solution…..